Finnish education has been a focus of global interest since its first PISA success in 2001. After years of superficial celebration, astonishment and educational tourism, the focus has recently shifted to what is possibly the most interesting element of this Finnish success story: that Finnish schools have been effectively applying methods that go against the flow of global education policy with no testing, no inspection, no hard evaluation, no detailed national curriculum, no accountability and no hard competition. From a historical and sociological perspective the Finnish case is not merely a linear success story, but is part of a controversial and paradoxical struggle towards Utopia: towards egalitarian schooling. 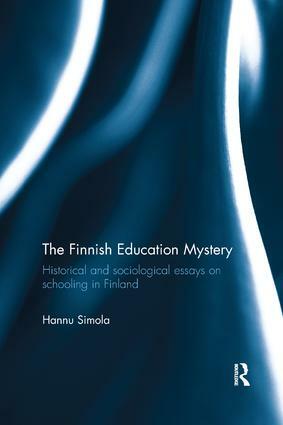 Bringing together a collection of essays by Hannu Simola and his colleagues, this book analyses the key dimensions of schooling in Finland to provide a critical, analytical and uncompromising picture of the Finnish education system. Going beyond the story of success, the book reveals the complexities of educational change, but also identifies opportunities and alternatives for smart political action in complex and trans-national societies. Including a selection of key chapters on Finnish education policy and governance, teacher education and classroom cultures, the book will be of interest to researchers, academics and postgraduate students in comparative education, teacher education, educational policy and educational reform. Firmly bolted into the air: wishful rationalism as a discursive basis for educational reforms? Quality assurance and evaluation in Finnish compulsory schooling: a national model or just unintended effects of radical decentralization?